Rep. Sanford Bishop GA-02 just stood up again against the Sabal Trail fracked methane pipeline invader, for the Flint River, the Floridan Aquifer, and his constituents in Albany, and Dougherty and Terrell Counties, pointing out FERC shouldn’t have issued a certificate before all the state Clean Water Act Section 401 permits were in, and asking for a Supplementary Environmental Impact Statement (SEIS). I’m sure we’re all looking forward to similar requests from Austin Scott GA-07, in whose Congressional district Sabal Trail would cross Okapilco Creek and the Withlacoochee River, and in which Moultrie, Valdosta, and the counties of Colquitt, Brooks, and Lowndes passed resolutions against the pipeline. And especially from Ted Yoho FL-03, in whose district Sabal Trail would cross the Suwannee and Santa Fe Rivers through the most vulnerable recharge area of the Floridan Aquifer in the Florida Springs Heartland, and in which the counties of Hamilton, Suwannee, and Marion have already sent letters to the Corps, like Rep. Bishop just asked for a Supplementary Environmental Impact Statement (SEIS). We know the Corps did a SEIS for Keystone XL. The Corps should do a SEIS for Sabal Trail, so many more discrepancies and geological reports and segmented projects can be sent in so everyone can see (as Rep. Yoho already saw in person) there are sinkholes far closer than Sabal Trail told FERC, and water travels many more miles underground than Sabal Trail accounted for, plus Sabal Trail has no realistic plan to deal with a cavern collapse. The Corps will be more likely to do a SEIS when it gets more letters from more members of Congress. I am writing to express my concerns regarding Sabal Trail Transmission, LLC’s (“Sabal Trail”) proposal to construct a 516-mile-long, 36-inch-diameter natural gas pipeline through Alabama, Georgia, and Florida. 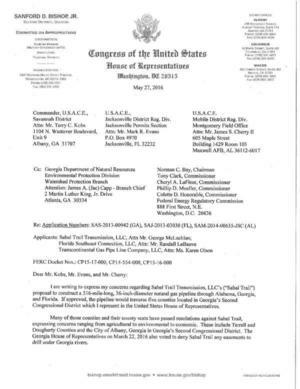 If approved, the pipeline would traverse five counties located in Georgia’s Second Congressional District which I represent in the United States House of Representatices. Many of those counties and their county seats have passed resolutions against Sabal Trail, expressing concerns ranging from agricultural to environmental to economic. These include Terrell and Dougherty Counties and the City of Albany, Georgia in Georgia’s Second Congressional District. The Georgia House of Representatives on March 22, 2016 also voted to deny Sabal Trail any easements to drill under Georgia rivers. There is significant evidence from the WWALS Watershed Coalition, Inc., Flint Riverkeeper, and many other environmental organizations of sinkholes, springs, and the underground transmission of water for many miles that were not included in the Federal Energy Regulatory Commission (FERC) Final Environmental Impact Statement (FEIS). As you know, Spectra Energy, Inc., of Houston, Texas is the pipeline company that proposes to build Sabal Trail. I am concerned by the April 29, 2016 explosion of a Spectra Energy pipeline in Salem Township, Pennsylvania, which incinerated a house and trees, put a man in the hospital with third-degree burns, rerouted natural gas deliveries in the eastern United States, and raised natural gas prices. This explosion came one year to the day after the same Spectra Texas Eastern Transmission pipeline exploded under the Arkansas River in Little Rock. In addition, the Dalton Expansion Project damaged the Etowah River in Georgia. That pipeline project is an offshoot of the same Williams Company Transcontinental Pipeline Company (Transco) pipeline from which Sabal Trail proposes to get its natural gas. While the Transco Hillabee Expansion Project was considered by FERC along with Sabal Trail and Florida Southeast Connection in its Southeast Market Pipelines Project (SMPP), the Dalton Expansion Project was not. I am concerned about the possible segmentation of projects, despite the rules of FERC, of the Corps, and of a recent federal appeals court decision. 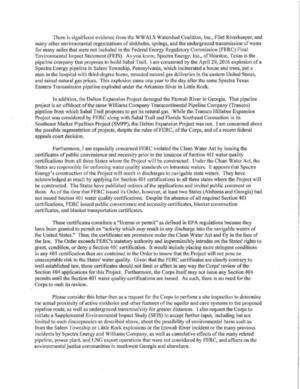 Furthermore, I am especially concerned FERC violated the Clean Water Act by issuing the certificates of public convenience and necessity prior to the issuance of Section 401 water quality certifications from all three States where the Project will be constructed. Under the Clean Water Act, the States are responsible for enforcing water quality standards on intrastate waters. It appears that Spectra Energy’s construction of the Project will result in discharges to navigable state waters. They have acknowledged as much by applying for Section 401 certifications in all three states where the Project will be constructed. 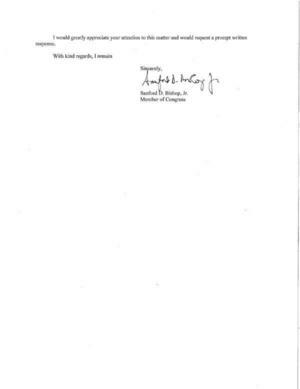 The States have published notices of the applications and invited public comment on them. As of the time that FERC issued its Order, however, at least two States (Alabama and Georgia) had not issued Section 401 water quality certifications. Despite the absence of all required Section 401 certifications, FERC issued public convenience and necessity certificates, blanket construction certificates, and blanket transportation certificates. These certificates constitute a “license or permit” as defined in EPA regulations because they have been granted to permit an “activity which may result in any discharge into the navigable waters of the United States.” Thus, the certificates are premature under the Clean Water Act and fly in the face of the law. The Order exceeds FERC’s statutory authority and impermissibly intrudes on the States’ rights to grant, condition, or deny a Section 401 certification. It would include placing more stringent conditions in any 401 certification than are contained in the Order to insure that the Project will not pose an unacceptable risk to the States’ water quality. Given that the FERC certificates are clearly contrary to well-established law, those certificates should not limit or affect in any way the Corps’ review of the Section 404 applications for this Project. Furthermore, the Corps itself may not issue any Section 404 permits until the Section 401 water quality certifications are issued. As such, there is no need for the Corps to rush its review. Please consider this letter then as a request for the Corps to perform a site inspection to determine the actual proximity of active sinkholes and other features of the aquifer and cave systems to the proposed pipeline route, as well as underground transmissivity for greater distances. I also request the Corps to initiate a Supplemental Environmental Impact Study (SEIS) to accept further input, including but not limited to such discrepancies as described above, about the possibility of environmental harm such as from the Salem Township or Little Rock explosions or the Etowah River incident or the many previous incidents by Spectra Energy and Williams Company, as well as cumulative effects of the many related pipeline, power plant, and LNG export operations that were not considered by FERC, and effects on the environmental justice communities in southwest Georgia and elsewhere. I would greatly appreciate your attention to this matter and would request a prompt written response. Numerous other Florida and Alabama members of Congress have districts in the path of Spectra Energy’s Sabal Trail, FPL’s Florida Southeast Connection, or Williams Company’s Transco Hillabee Expansion Project, as well as in the path of other strongly related yet segmented pipelines such as the Dalton Expansion Project in Georgia and the numerous liquid natural gas (LNG) export operations and LNG transport schemes by road and rail in Florida. They could all write to the Corps, as well. Any of you can write to the Corps asking for a SEIS, or members of Congress to ask the Corps that, as well. Here’s a petition. Or look yours up by ZIP code. Remember to ask them to ask the U.S. Army Corps of Engineers for a Supplementary Environmental Impact Statement (SEIS). This entry was posted in Aquifer, Law, Pipeline, Politics, River, Safety, Springs and tagged Albany, Aquifer, Austin Scott, cave, conservation, corrosion, Dougherty County, explosion, Flint River, Flint Riverkeeper, Florida, Floridan Aquifer, Georgia, Law, leak, north Florida, Okapilco Creek, pipeline, Politics, recharge, river, Safety, Santa Fe River, sinkhole, south Georgia, springs, Suwannee River, Ted Yoho, Terrell County, watershed, Withlacoochee River, WWALS, WWALS Watershed Coalition on May 27, 2016 by jsq.